Health Fair Connections | Could $526k in revenue be generated from a $349 HFC Charter Membership? It all depends on a number of different factors, like your service category (i.e. radiology) and the activity in your area (greater Raleigh had 75 health fairs in 2017). Under the right conditions, yes! I generated well over 526K from a years' worth of health fairs for the sleep center I represented as an exhibitor back in 2010. This is one of the main of the reasons I decided to co-found HFC. Don’t believe me? That’s fine :) I have the math to back it up and will provide those details towards the middle of this blog post. Yes, this is technically a hypothetical scenario since the membership wasn’t available back when I was exhibiting in health fairs. However, it is important to note that HFC’s Charter Membership would only magnify my ability to generate business from health fairs and this marketing channel. Some people know how to start and develop great businesses, most don’t. Some people know how to become great athletes, most don’t. Some people know how to cook, most don’t lol (it gets a bit tricky there :)). Some people know how to get into great shape, most don’t. Some people know how to consistently get “A’s” on test, most don’t. Frankly, the stats prove my statements above to be correct. The numbers don’t lie. It’s a little bit of a stretch but what I’m leading to is the 80/20 Marketing Principle. The 80/20 Marketing Principle is an extension of the Pareto Principle Concept: “Pareto noted that the majority of wealth in a free market economy is concentrated within a relatively small group of people -- roughly 20 percent of the population”; this is according to a post by Neil Kokemuller. 80% of the wealth generated from health fairs are from 20% of exhibitors. With that said, some people know how to generate a mountain of revenue from health fairs (+ help serve new patients/customers, as it’s not all about the money), while most don’t and don’t know how to do this. I’ve attended more than 300 health fairs via HFC, and even more as a vendor before co-founding HFC. I personally know because I’ve seen it for myself. 20% of exhibitors are crushing it and generating 80% of the wealth from this channel of business. Within a few seconds of walking into the room, I can tell which exhibitors these are. They’re the ones that are standing, smiling, shaking hands with others, and collecting information to follow-up with prospects. I personally know how to generate tons of business from health fairs and that’s why I started Health Fair Connections (HFC) with my fellow co-founders. I say this to let you know that I can help change the game for you in a matter of minutes with nothing else needed as far as a spiel or lecture goes outside of this blog post (No, I don’t have a course to sell you NOR will I anytime soon). If your health fair strategy isn’t optimized like you know it should be, I can steer you in the right direction. By taking just a few minutes to read this blog post, you’ll know exactly what you should do to generate a substantial amount of business from health fairs. And, for those of you with objections, allow me the opportunity to decimate any objections that you may have (I’m sure some are coming to mind). I’ll address those at the bottom of this post. As mentioned previously, before co-founding HFC with three others, I was the marketing rep for a sleep medical center that had a DME counterpart. 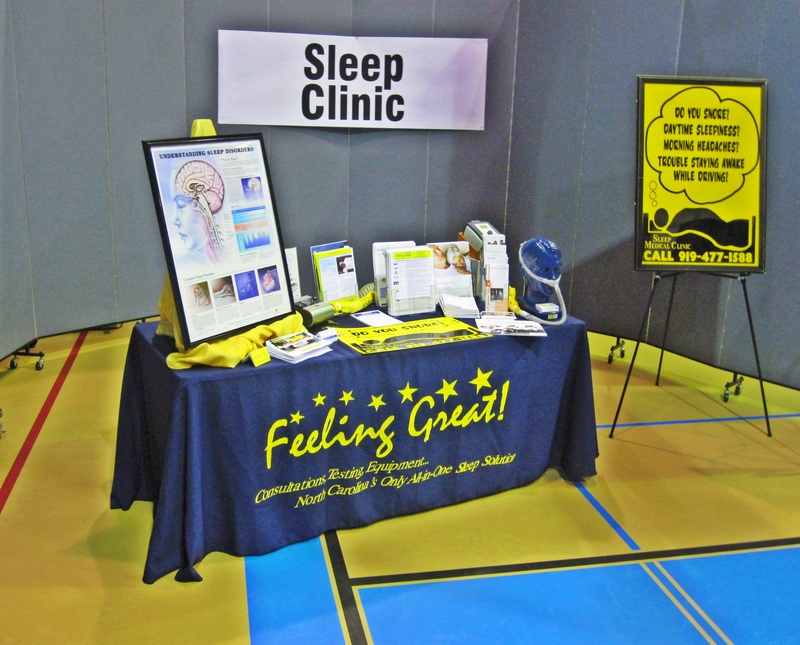 While working at the sleep center, I attended many health fairs. For each health fair I attended, I would engage each prospect that visited my booth with the goal of screening each for sleep apnea, as sleep apnea affects 1 in 18 Americans. For each health fair I attended, I used a lead-generation formula to help me capture leads from each health fair opportunity. You can use it too. Regardless of what service category you’re in (i.e. acupuncture to orthopedics and beyond), this formula for generating leads and converting them to customers or patients can work for you, with some minor adjusting. If it was okay with the employee, I would turn the screening tool over and collect their contact information [this is key!]. When I returned to the office, I would hand the questionnaires off to the receptionist, then have her/him call the leads the next day. Out of 40 or so leads I'd collect at each health fair, roughly six (6) would turn into sleep consultations with our sleep physician. That’s how I did it and it could be better, but do you see how a formula like this can work for you? 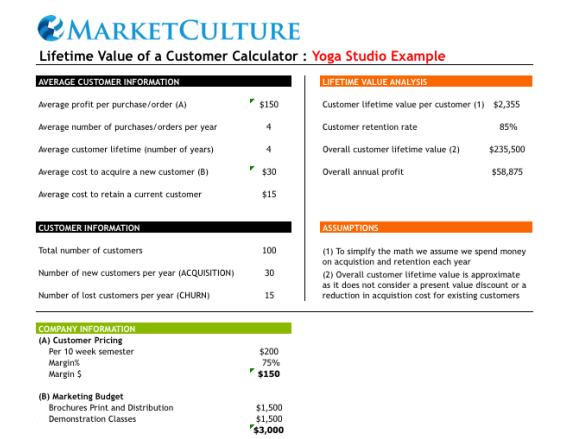 Hopefully, this is helpful for you and you can apply a variation to your business. As I mentioned at the beginning of this post, I generated over $526k in revenue for the sleep center I represented from a year’s worth of health fairs. Now, wait a minute. Aren’t I leaving out additional revenue generated from this figure? Yes, and that’s why I said 526k+ was generated from a years' worth of health fairs because I didn’t add in the consults and additional sleep studies from others who dropped. And again, there are sleep studies which I haven’t been able to locate those exact stats but you can just say add on another 50k to the 560k, pushing the revenue figure to over 610k. Some patients generated more than $6,500 over the course of 3 years as some had several titration sleep studies, more expensive equipment (i.e. BiPAP), etc.. To add to that, if a patient had private insurance that reimbursed well, that’s even more revenue generated. $526 was an average figure after insurance reimbursement and the patient paid. Some health fairs brought in way more than six (6) new patients (i.e. a company with 800 employees would generate more leads and in the end, more patients). This is also an average figure. So, these are averages and conservative figures. Hope this makes sense. I was a sub-par sales and marketing professional in 2010… I was 24 and had so much to learn (and I still do). I didn’t have HFC’s Charter Membership. The membership has only been available for 6 months; I didn’t have the advantages, benefits and features of the membership.. To take it a step further, I didn’t have the cost savings of the membership, as sometimes I paid $3-400 per booth for a single health fair. I’m dead serious. As you know, it’s only $349 for HFC’s charter membership (which it should be in the thousands). My health-fair-lead-gen process could have been optimized. If I had to go back, I would have collected employees info on an iPad or similar device, as opposed to paper. Then, I would have pushed leads electronically to the receptionist desk at the sleep center before leaving each health fair I attended and had the receptionist call the prospective leads that afternoon. Hindsight’s 20/20. As I mentioned above, in 2010, HFC’s Charter Membership didn’t exist, as HFC wasn’t even a company at that time. With HFC’s features and benefits that come with the membership, I could have most likely doubled my impact (especially with the direct line of communication charter members have with health fair organizers). Even better, I could have cut down on the sleep center’s health fair expenses. [-] Promotion to hundreds of companies. [-] Resource for corporate relationships that would allow me to message organizations anytime to share with them my offerings and to set up onsite meetings and more. [-] Online exposure with HFC’s SEO’d One-Page Corporate Wellness Website. [-] Reputation management to allow me to respond to ratings and reviews left by health fair organizers. The beautiful thing is that you do or may be able to have access to these advantages, benefits, and features with HFC’s Charter Membership, which is only $349 for 12 months (comes to $29 per month if you divided $349 by 12). And for a small percentage of you, you may want to raise objections as to why $349 is too much for a membership and/or something to the effect of how your business or operation isn’t similar to a sleep center nor does your area have the volume of health fairs that Raleigh, NC has. That’s a fair and a natural reaction. From my experience, I’ve found this normally happens with the 80%’ers - those who struggle to generate business from health fairs. And if you’re currently in that bucket of exhibitors, I’m here to help you move over to the 20% bucket. Any objections that have popped into your head, don’t worry. I’ll dismantle them with sound logic (at least I think it’s sound logic lol). With that said, I’ll address the top 6 objections that the 80%’ers have asked me. As I alluded to, the exhibitors that are active on HFC, many of which have purchased the exclusive Charter Membership, normally aren’t the ones that bring these objections up. Those are the ones that are succeeding, week over week, month over month; their fruitful efforts are compounding! These are the 20%’ers. Here are the top 6 objections I’ve personally encountered, with my responses to those (no need to proceed with caution, I left out the swear words :) lol). So let’s make your situation worse than that example. Say you generate 1/10th of what I used to generate per customer/patient while working at the sleep center. Let’s also say you attended 1/10th of the health fairs I did. If you generated 1/10th of the amount I generated for the sleep center I represented, that’s still $35k and that is IF you attended 54 events like I did in 2010. Regardless, that comes to $650 per event or per single unit. Now, we have our unit economics: $650 per event. So, $650 per event vs $6500. That’s cool. Now, minus your expense for the day and you have your profit. Unfortunately, I don’t know how you run your business, but say you have $300 in expenses per health fair (your cost, materials, drive time and etc.). That’s $350 in profit, per event! Say you attend five (5) events over the course of the year. That’s still $3250 generated from five (5) events. That’s $1750 in profits, considering your expenses are super high, at $300 per event. Is that worth it to you? Remember, this is generating 10x less than the sleep center I used to work at and only 5 events, which is 1/10th of the events I attended. To be frank, the sad fact is most folks don’t understand the lifetime value of a customer (LTV), loss leaders, or many basic marketing concepts, therefore are unable to calculate the revenue potential for health fairs and are unable to justify the investment. If this is you, we’ve all been here. I have! I recommend turning to Google and searching for the concepts and terms I just mentioned, then read about each to elevate your marketing knowledge. I’ll also provide links to a few HFC resources, which elaborates on some of the concepts I just mentioned. If I owned and operated a yoga or massage studio, health fairs would be extremely profitable for me. Personally, I truly believe health fairs would help me break out of the 80%’ers to the 20%’ers. Allow me a few seconds to change your outlook. Say you’re a yoga studio. Let’s say you only do 10 health fairs via HFC in a years time. Personally, if I had a yoga studio, I’d give away two free yoga sessions to everyone who came by my health fair booth. Out of that number, a percentage of leads would stick with my studio for a few months and some for much longer, falling into the LTV group. Starting to see how it works? Sometimes it’s hard for me to have sympathy for exhibitors or folks who bring up this objection. It’s almost not worth my time to go into educating them, as there’s no ROI in me to do so. But, I like to help people. And if you have this objection, you’re not alone. For years, Jeffrey Grossman, an acupuncturist, didn’t generate any leads from health fairs until he started using a call to action card, as he calls it: Check out his short YouTube video. 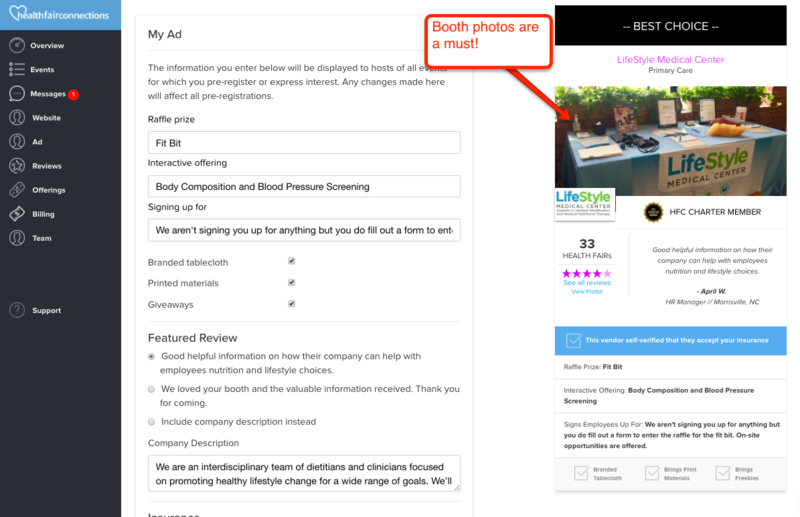 If you have this objection (the - “I don’t see any value from health fairs”), I strongly encourage you to reconsider your health fair strategy as far as generating leads go, and I mean that sincerely. Refer to my success formula for generating new patients in the first part of this blog post, as well as the outline directly below and short video links. I could spin it a few different ways and be more concise - this was just off the top of my head when I wrote this post. Again, this is a simple and basic example hopefully you can use to some extent. Regardless, you need to figure out how to collect information and follow up with customers. Literally within an hour, if I was an exhibitor on HFC, I would share my HFC profile via LinkedIn to HR managers on LinkedIn at the big companies I wanted to get into and land meetings. After all, there’s a LinkedIn share button on HFC’s basic vendor profile and the one-page corporate wellness website (an upgrade from the basic profile that comes with the membership); this makes sharing easy. The button allows you to share right from your profile or one-page website. Each time you click the button and share with individual HR managers, I would simply ask for a meeting with that particular HR manager or to continue the conversation. I know you know the old saying, “don’t ask to her to marry you on your first date.” The same goes for outreach. You have to take building relationships one step at a time. Relationships are slow progressions. You don’t become best friends with someone in a matter of minutes, do you? Start slowly. Those who understand this see exponential results over those who don’t. Once you land a meeting, take it a step further and ask if you can attend their annual employee health fair. And if it applies, see if you can come back onsite to offer employees workshops, screenings, lunch 'n’ learns, counseling, etc. Use LinkedIn sharing to create awareness and to get into the door. These steps will get you into health fairs. Noticed the health fair count and avg. 4.8-star review that has resulted from the application. I’m making light of the situation, but 4 out of 5 times I would assume this to be the case, as I spoke with a marketing expert recently about this in particular and the marketing expert assured me this was the case. HFC represents now over 110 service categories, from acupuncture to hospital health systems to yoga. Nearly all of those categories have customers or patients that generate enough LTV per customer or patient that makes health fairs a wise investment. There’s not a category of exhibitors that can’t afford HFC’s membership and that goes for non-profits. It all comes down to whether health fairs are a priority or not and a channel of business or marketing vehicle they value. To justify this investment, find out what your LTV is per customer by referring to my examples stated earlier in this post, or turn to Google. And remember, before HFC, if you went through another 3rd party health fair company, you could pay upwards of $3-400 per health fair booth. HFC offers a charter membership that’s a fraction of what you would pay the old fashion way if you attended serval health fairs. The membership is also 1/5th of what you’d pay for a decent sized trade show booth. ...especially when considering all that has been said about how health fairs are one of the best ways to generate leads. Health fairs put you in the middle of the funnel, other marketing vehicles don’t and just add in more barriers to actually getting to the point of speaking with hot leads via phone or face-to-face. Does this make sense to you? Think about it... At health fairs, you get to speak face-to-face and shake hands with employed and insured adults, allowing you to build trust in a matter of minutes. Does TV, radio, or the internet allow you do that? How many more loops do leads generated from TV, radio, or internet marketing vehicles do they have to go through in order for you to be able to speak with them face-to-face? Allocating resources to pay for ineffective marketing channels is like throwing money to the wind. The 20%’ers - the smart marketers, sales reps, and business leaders don’t blow their money. Unfortunately, 80% do. Which segment do you to fall into? Which segment would you like to be in within a years time? From my personal experience at the sleep center, health fairs generated more leads than radio, TV, internet, Google PPC, and other means of marketing and outreach for the sleep center I represented. Not only did it do that, health fairs generated quality and qualified leads. When I first started at the sleep center, we spent $5000 for one month of radio advertising, which leads to a few phone calls, and not even a single patient that we could trace. I’m sure it did something on the branding end, but there was no way to measure it at that time. You could generate a massive amount of business and revenue from health fairs if you execute the right strategy. HFC’s Charter Membership will only mangifiy the results you generate from health fairs. We hope this post is helpful and that it makes sense. If you have any questions or would like more info, feel free to email me at squad[at]healthfairconnections[dot]com with the subject, Attn. : Kyle - questions about my charter membership.